Fruitless Pursuits: Tuesday Bounty! Glorious Bounty Gets Stomped! 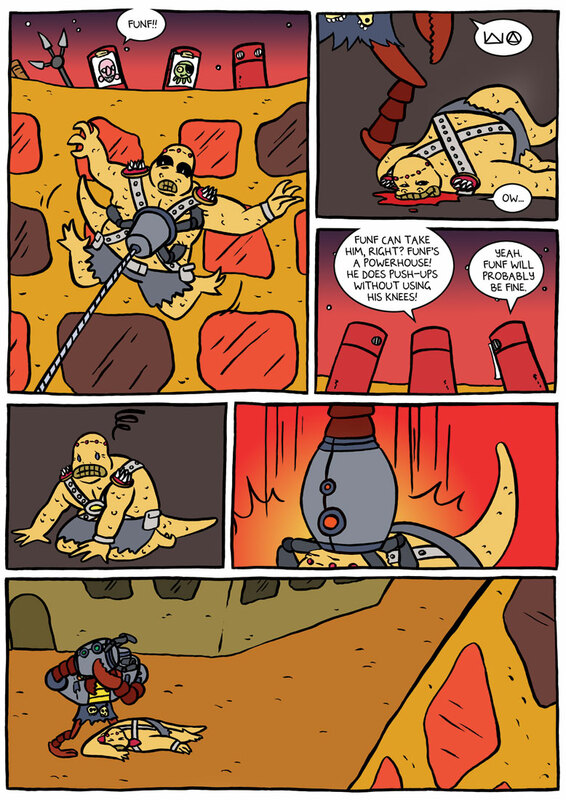 It's Tuesday again and that can only mean a brand new page of ongoing sci-fi/humour webcomic Glorious Bounty, drawn by the steady, reliable paws of Edward J. Grug III and written and coloured by me! When we last saw the Bounty crew, Deevis and Bruce (in temporary robot bodies) were about to get grappled by a giant, armoured alien target who was way out of their league. Luckily pudgy lizard friend Funf threw himself in front of his doodz. Will this end badly? You know it will! Click to embiggen or check it out at the official site. And if you're a surly hold-out, then you need to wisen up and realise that it's never too late to start reading Glorious Bounty! In fact you can go all the way back to chapter one RIGHT HERE. And I am going to goddamn badger you until you do!